Use these skin-soothing body wash and liniment recipes on your horse (or yourself) after exercise – to remove sweat, to tone skin, and to treat bruising, sprains, or pulled or sore muscles. Put 1/2 c dried arnica or calendula flowers in a quart jar of water. Let steep for 30 minutes or more, or microwave until hot (not boiling) and let steep for 5 minutes. Tilt the jar lid and strain liquid off into a clean bucket, discarding herbs. Add remaining ingredients to the bucket, then mix with water to make 1 gallon liquid. Sponge onto your horse to remove sweat, to tone and refresh skin, and to soothe tired, sore muscles. No need to rinse. Keep away from eyes and other sensitive areas. Add ingredients to 1 gallon of water. Sponge on to remove sweat and tone skin. No need to rinse. To make your own body wash concentrate, premix equal parts rubbing alcohol and vinegar. Add a few drops of essential oils. Dilute with water before using – add 2 cups concentrate to 1 gallon water. Instead of using essential oils for fragrance, add fresh or dried herbs (try peppermint or rosemary) to steeping water along with arnica or calendula. 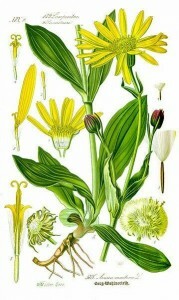 Place arnica or ginger in a quart jar. Fill the jar with rubbing alcohol and seal tightly. Store in a warm, dark spot for a week or two before using. Pour the liniment off into a clean jar, tilting the lid to strain out the plant material. Rub liniment into sore muscles or joints to relieve pain and reduce inflammation. Calendula is a topical anti-inflammatory used to treat skin irritation or inflammation – sunburn, insect bites, and abrasions – and its antiviral and antibacterial effects help with wound healing. More about Calendula. Ginger is a warming topical anti-inflammatory used to increase circulation and to relieve pain from sore muscles and arthritic joints. It is antibacterial, but may sting if applied to an open wound. 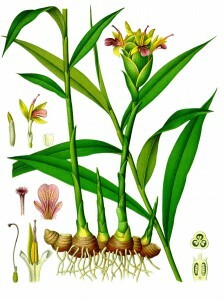 More about Ginger. Arnica is a topical anti-inflammatory used to treat deeper tissue irritation or inflammation – bruises, sprains and strains, and muscle aches. It is also said to help heal wounds. More about Arnica. Caution: Arnica montana may cause contact dermatitis (skin irritation) in sensitive individuals, both horse and human. Do not take internally. Keep away from eyes and other sensitive areas. Why add vinegar and rubbing alcohol into the mix? Vinegar helps dissolve away greasy salt deposits from a sweaty horse, soothes itchy skin and sunburn, restores skin’s naturally acidic ph balance, and is a mild antibacterial and astringent. Rubbing alcohol helps cleanse skin by dissolving grease and oils, cools as it evaporates quickly, and is a mild disinfectant. Where can I find bulk herbs and essential oils? Fresh ginger root is available in the produce department at many larger grocery stores. Buy extra to plant in your garden and grow your own!